Naomi Osaka is enjoying a wonderful start to 2016. The 18-year-old Japanese player, who is no longer restricted in the number of tournaments she can play, has already won ten matches this year; Osaka won two qualifying matches in Brisbane, three in Hobart to qualify for the main draw, and then saved match points in her first round match against Jarmila Wolfe. Osaka then went straight to Melbourne and won another three matches in qualifying, all in straight sets, successfully allowing her to participate in her first Grand Slam main draw. 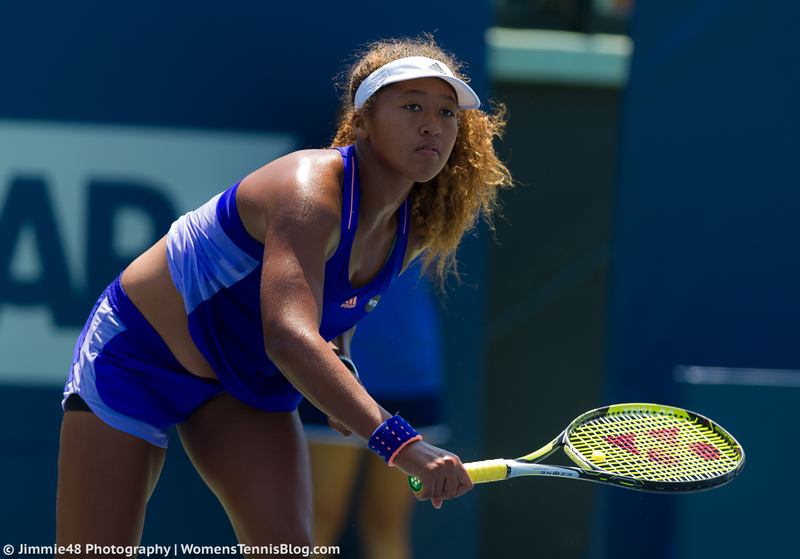 Osaka produced a smart and measured display to defeat Donna Vekic in the first round, 6-3 6-2, in 72 minutes. I was really impressed with the Japanese player who raced out into a 5-1 first set lead. She has a nice way about her and comes across very relaxed on court. Vekic was pretty wild with her groundstrokes, going for crazy winners and not looking particularly stable. The wheels started to come off a little for Osaka with Vekic getting a couple of games and rushing her into errors but Vekic was too inconsistent to maintain her level. Osaka dominated the second set, hitting some lovely forehands. I loved how she kept going behind Vekic with that shot. Osaka finished with 23 winners to 21 unforced errors while Vekic’s 29 unforced errors was ultimately the undoing of her. Osaka’s reward is a tantalising second round match with Elina Svitolina. The 21-year-old Ukranian won her first match, also for the loss of five games, against Victoria Duval, 6-2 6-3. It was the second time Svitolina had played Duval as the pair had played in Hopman Cup singles action with Duval winning exactly the same number of games. Svitolina played well at the Hopman Cup, earning a first ever win (though not technically counted) against Karolina Pliskova. However, she lost her final singles match in the final to Daria Gavrilova; the Aussie was rewarded for her positive play with Svitolina missing a string of set points. Svitolina matches Duval's defensive ability & adds more power to win a messy match, 62 63. Head-to-head record: The pair have played once before with Svitolina defeating Osaka… in Osaka! The scoreline was 3-6 6-3 6-4. January 20, 2016 in Australian Open, Osaka, Svitolina, WTA. While it is thru that it’s your right to voice out your opinion, I feel that saying someone does not deserve his/her spot is very unnecessary. It’s disrespectful. You lack respect for tennis and it’s professional players. This blog is great but comments like yours should never be published. What is wrong with Vivek? Strange! Agreed. Ana is one of the best when her game comes together. Its easy to forget when shes losing frequently, but only a couple of years ago she was beating top players left right and centre. I think Anna Ivanovic is in the “upset” zone. Sevastova has the games to upset her. I walked passed Timea vs AKS match for about 20 minutes in the second set. Timea looked really sharp on that day. The court definitely favours Beck but it depends on her mindset. She can melt down anytime. So this one can go either way and should be a three setter. Looking further ahead to Friday, I would say Suarez Navarro and Belinda Bencic are both very vulnerable to upsets. If Bondarenko plays near the level she did against Kuznetsova, which is far easier said than done as it was potentially the best performance of her entire career, Bencic won’t be able to cope with her aggression and weight of shot. I haven’t seen Kulichkova play this week, but her results alone are very encouraging, and she’s a player that, when she’s on her game, can outhit most people out there. Suarez Navarro is vulnerable to that kind of game if its combined with consistency, and was caused some real problems by the aggression of hereto unheard of Sakkari, and Kulichkova has a lot more firepower at her disposal than the young Grecian. Sakkari should have won the match instead of Suarez Navarro. Kulichkova will defeat her. Kulichkova is another rising star. I watched the highlight of her match last night. She looked cool and controlled her temper really well. If she can do that, Suarez Navarro is on her way home. Bondarenko can challenge Bencic provided she can control her emotions. If she wins the first set, she will win. Naomi is fun to watch. I like her forehand so much. She can accelerate the FH anytime as her wish! However, I think Elina should win this one in 2. My only doubt over Kulichkova is the error count. CSN can wobble and make mistakes in big moments, but for the most part she is very steady and keeps the pressure on her opponent til they crack. Sakkari was impressively steady herself, and I fear Kulichkova has a lot more cheap errors and thrown away game in her. But we shall see. Certainly in with a great chance if she puts it all together. Agree with all this. I’m going CSN in 3. Well done to S.Zhang she continues on her winning way she defeated A.Cornet who was all out of sorts 63 63…good to see Zhang backing up this win after taking out the No 2 seed Simona Halep in her previous match.Zhang will play Lepchenko next. I must say I’m equally happy with zhang’s result against Cornet because she really did beat Halep and fortunately suffered little letdown. I think it will get tougher down the road…but lepchenko I think is doable. Thankfully the aussie weather has been forgiving sofar. Hmm…just when I thought Ana was going to crash out before the likes of jankovic and svitolina, save for lisicki, she’s proven me wrong. She really does have a relatively easy quarter to hack through, wise to make hay whiles it is still sunny. Disappointing from Svitolina. She played so aggressively in her RR matches in Perth and lost the final to Gavrilova when she became passive. She should have learned her lesson by now! Thrilled Ana Ivanovic proves her haters wrong though, great stats from her match against Sevastova. Another disappointing loss for Svitolina but I am excited about Osaka. Decent win for Ivanovic, Keys will be tough in R3. Ivanovic played pretty well. She did a good job of mixing up her play to keep Sevastova totally off rhythym. I just don’t think shes moving or returning as well as she did in 2013/4. Hopefully these two wins give her a boost and she takes Keys out. She has a relatively good record in this tournament. She’s won a lot of matches here in the past. A very brit tennis question, are the encouraging results of Broady, Konta partly influenced by Murray’s recent success at major tournaments or the gaping hole in LTA female tennis due to the slight decline of Robson and Watson and retirement of others? Hmm I’m not sure. Konta seems to have made huge strides mentally while Broady just seems to have really knuckled down. Great to see some success for the British women and fingers crossed Laura can come back strong.